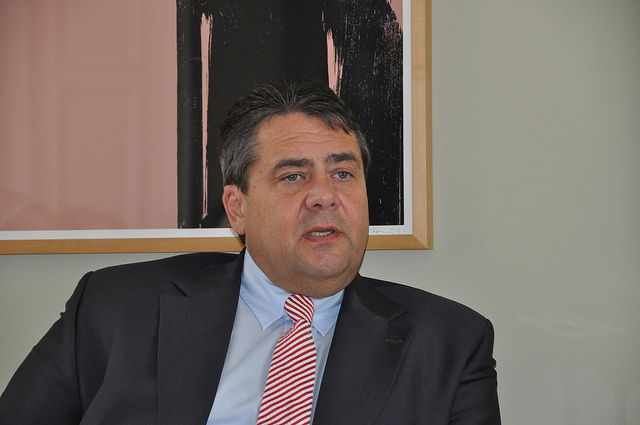 The German government wants Greece to stay in the eurozone and there are no contingency plans to the contrary, Vice Chancellor Sigmar Gabriel said yesterday (4 January), responding to a media report that Berlin believes the currency union could cope without Greece. Gabriel, the Economy Minister and leader of the centre-left Social Democrats (SPD), also told the Hannoversche Allgemeine Zeitung that the eurozone had become more resilient in recent years and could not be “blackmailed”. “The goal of the German government, the European Union and even the government in Athens itself is to keep Greece in the eurozone,” Gabriel said in the interview to appear on Monday. “There were no and there are no other plans to the contrary,” he said, and noted the eurozone had become far more stable in recent years. “That’s why we can’t be blackmailed and why we expect the [Greek] government, no matter who leads it, to abide by the agreements made with the EU,” he said referring to the 25 January Greek election and possible change of government. Earlier, a spokesman for Chancellor Angela Merkel, Georg Streiter, said the German government expects Greece to stick to the terms of its 240 billion euro EU/IMF bailout agreement. Streiter declined to comment on a report in Der Spiegel on Saturday that said Berlin had shifted its view and now believed the eurozone would be able to cope with a Greek exit, or “Grexit”, if necessary. Der Spiegel reported that Berlin considers a Grexit almost unavoidable if the left-wing Syriza opposition party, narrowly ahead in opinion polls, wins Greece’s election. Syriza wants to cancel austerity measures and a chunk of Greek debt. But the report said that both Merkel and Finance Minister Wolfgang Schaeuble now believe the eurozone has implemented enough reforms since the height of its debt crisis in 2012 to make a potential Greek exit manageable. In addition, the eurozone now has an “effective” bailout fund, the European Stability Mechanism (ESM), another source added. Major banks would be protected by the banking union. As the eurozone’s paymaster, Germany is insisting that Greece must stick to a course of austerity and not backtrack on its bailout commitments – especially as it does not want to open the door for other struggling eurozone members to relax their reform efforts. Peter Bofinger, on the “wise men” council of economic advisers to the German government, warned against a Grexit. French president Francois Hollande told France’s Inter radio on Monday (5 January) that Greece had paid a heavy price to stay in the euro and it was “up to the Greeks” to decide whether to now remain a part of the single currency. Spiegel Online: Spekulationen über griechischen Euro-Ausstieg: "Wir wussten, dass solche Berichte kommen würden"
There is a whole debate if Greece should leave or not the eurozone. If Greece runs out of money like happended before, it will exit the eurozone.